ENTEBBE – Police have confirmed that one person died on the spot and five others sustained score injuries after an ambulance colliding with a trailer along Queens Way, along Entebbe road. 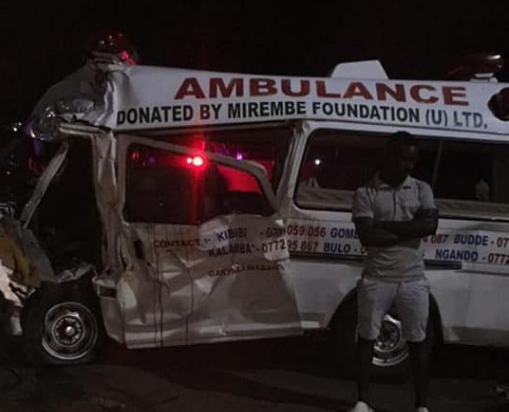 According to reports, the accident occurred in wee hours of the night, along Entebbe road as the driver of truck registration number UBE 164D driver failed to give way for the ambulance registration number UBA 513B leading to the collision. The Kampala Metropolitan Deputy Police spokesperson, Luke owoyesigire said that one person died on spot. He adds that five people who are believed to have sustained serious injuries were rushed to Mulago hospital where they are currently getting treatment. Owoyesigire said investigations into the exact cause of the accident have started but both drivers are currently on the run following the accident.